If you’re reading this is because you’re looking for a place to practice and upgrade your tennis skills in Barcelona… and you couldn’t get to a better place. The Walter Grünfeld Tennis Academy is an international training centre located in the heart of Barcelona and one of the best tennis academies in Spain, with a professional approach to the game and the steps you should take to built a career as a professional player capable to get into the ATP list. 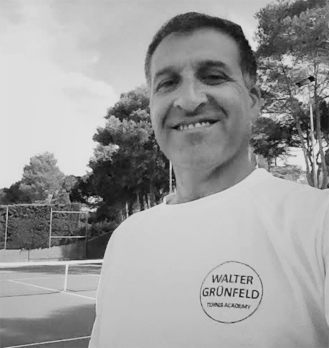 Here in The Walter Grünfeld Tennis Academy we have divided all our programs and tennis lessons in specific areas and levels in order to cover all the needs a tennis player may have and the expectations they might have from a training center, doing our best to help in the most..
Our Barcelona tennis academy offers not only one of the most complete training programs that can be personalized to suit every individual requirement, but a constant companion and a long term relationship with every player to make sure he or she takes the right steps into persuing a career in tennis and reach every professional goal they have. Our plans cover the mental, physical, technical and tactical area as well as the nutritional part of it that helps every player to get their body healthy and stronger. The academy’s stunning outdoor tennis fields makes everything easier. Currently run by Walter Grünfeld himself, an argentinian ex tennis player with more than 20 years of experience training professionals players, the academy’s philosophy is to offer each of our students a professional approach to tennis so they can see that, yes, it can be a hobby, but it could be a prolific career if they train hard and let us help them in every step of the process. WARRIORS COME HERE, WE ARE READY FOR YOU! Mental tennis trainer since 1990 specialized by DR James Loher, a renowned psichologist and tennis coacher. Walter has worked in different academies, tennis federations, teams, systems and ideas. He also has experience travelling with his own players around the world for tournaments (ITF and ATP/WTA). OUR ACADEMY OFFERS TO ALL OUR PLAYERS A PROFESSIONAL APPROACH TO TENNIS IN ORDER TO FROM ATHLETES AND CULTIVATE THEIR FUTURE CAREERS. OUR PROGRAMS ARE ORGANIZED INTO AREAS AND LEVELS TO COVER EVERY INIDIVIDUAL NEED OUR PLAYERS HAVE. BARCELONA IS THE HOME OF MANY TENNIS TOURNAMENTS AND COMPETITIONS OF EVERY LEVEL, AGE AND EXPERIENCE. As you might know, tennis in Spain is a big deal, but our idea is bigger than just a tennis school in Barcelona. Yes, we want to get the best tennis player out of you, but alongside this is Barcelona! And while you’re here, why not to explore every side of the city? As an academy concerned about the different ages and hobbies, we offer sports summer camps as an alternative to stimulate you and your children to have a healthy life while you have fun and explore the beautiful city of Barcelona. All our summer plans includes a variety of options so you can choose the one that suits you and your family better. We’re looking forward to welcoming you for a week, a month, or an entire year of training and being witnesses of your growing. You’re gonna be in one of the best tennis academies in Spain. Take the leap! “The Walter Grünfeld Tennis Academy is a place to get the best out of every player. The people that work with and support the players have one thing in common”.